Well-worn and adorned with a distinguished patina, the Beta Omicron chapter of Pi Kappa Phi Fraternity’s very first gavel will go on display in Natchitoches after a decades-long hiatus. The gavel, used by chapter leaders to signal the start of weekly meetings, was located earlier in 2015, after being lost for many years. The gavel first arrived in Natchitoches in time for the chapter’s chartering banquet on Saturday, September 22, 1956 at the Nakatosh Hotel. Other gifts were opened from chapters across the country, like Duke, Florida State, Parneil, Wisconsin, and Michigan State, according to an article appearing in the Current Sauce, Northwestern State’s student newspaper. 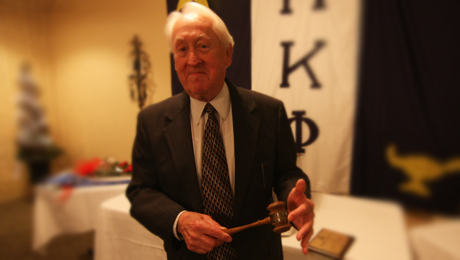 Founding archon Jack McCain, holding the Beta Omicron chapter’s original gavel in April 2015. Alumnus Dennis McDowell came across the artifact in his attic and passed it along to co-worker and fellow Beta Omicron chapter alumnus Kevin Bruce. Former archon George Cameron holding the original Beta Omicron chapter gavel in 1963. The Beta Omicron Alumni Chapter provided an engraved base for its display in the chapter house. In late April, the gavel returned to Natchitoches, where founding archon Jack McCain presented it to the student chapter at their Rose Ball formal. A growing number of historic items are being reunited with the chapter, including a 1970s chapter scrapbook and photos, 1960s Rose Ball souvenirs, copies of early issues of the B.O. Blast alumni newsletter, a 1970s decorative lantern, and the member badges of the 1956 founders. May 21, 2015 in Alumni.